In March 2008 we relaunched the SciDev.Net website to make it more accessible to our global audience. The site is now easier to use with improved navigation within a more logical website architecture, page load times are now faster and content is available in four languages (English, Arabic, French and Spanish). Our website is fully supported by the most popular Internet browsers (Microsoft Internet Explorer, Mozilla Firefox, Google Chrome, Safari, Opera). For the optimum viewing experience the latest versions of these browsers should be used to view our website. Please note our website was designed to be fully supportable in Internet Explorer 6 (and previous versions) as this remains the most popular browser in use in the developing world. As a large proportion of our audience are based in the developing world many of our users view the internet at a small screen resolution, typically 800 x 600 pixels or less. In light of this, the standard width of our web pages are set to 800 pixels to ensure those users visiting SciDev.Net have a good website experience. The core navigation menu on the left hand side is fixed on every page to enable easy access to the main homepage, and topic- and region-specific homepages. Navigating through hyperlinks on pages can also be achieved through pressing tab. Links to the contents pages and the top of the page are also present on article pages to aid navigation. If you are experiencing issues in accessing our website fully due to low-internet bandwidth in your area you may wish to access our website using a low-bandwidth simulator provided by Aptivate, an organisation specialising in international development IT. This free tool will simplify the viewing experience by reducing website page sizes (such as hiding images). 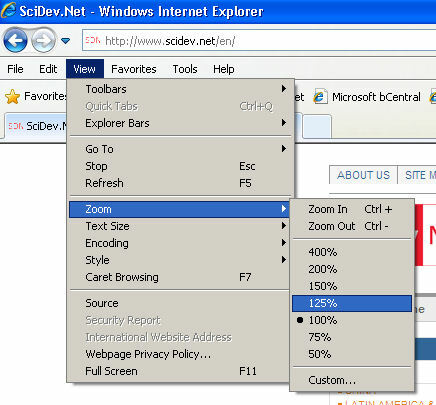 To access SciDev.Net using the loband simulator please click here. We welcome any feedback in the accessibility of our website to ensure user requirements are met. We hope our website is as accessible for as many people as possible but recognise there may be things that can be improved upon. Please email your comments to [email protected].